For extra heavy duty use indoors and outdoors, in weight rooms or entrance ways, The Mat King New Again Rubber Pavers & Tiles outperform most other floor coverings in durability, safety and low cost. They have an excellent reputation for withstanding constant abuse and high traffic while reducing slippage for large animals, at grocery store entrances and in fitness clubs. New Again Rubber Pavers and Tiles are nearly indestructible. 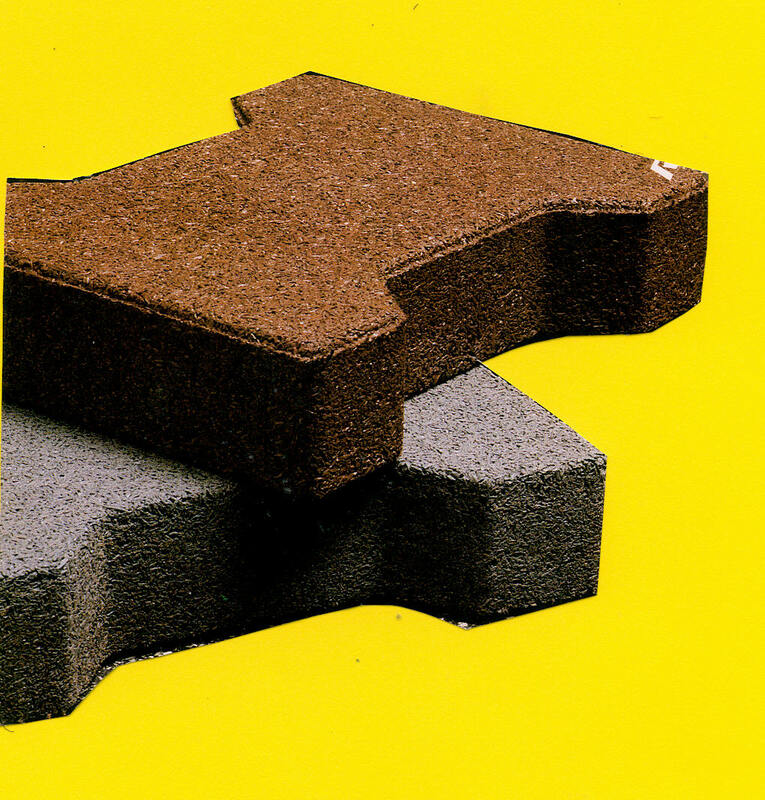 High strength and tare-resistance make them ideal products to deal with the toughest most heavy duty areas, outlasting commercial carpet and most other rubber flooring products. Unaffected by ice, water and extreme temperatures, these versatile recycled Pavers and Tiles are available in three solid colors. They can be permanently adhered to the surface or simply locked together to be removed and reused as needed. Typical Installations: Cornell University, Safeway Stores, the United States Military Academy, Keeneland Race Track in Lexington, KY, Arlington International, Churchill Downs in Louisville, KY and Belmont Park in Elmont, NY. National Food Store Chain chose New Again Rubber Pavers & Tiles for entrances and produce areas to reduce slippage, particularly in wet conditions. AMF (the world's leading bowling company) appreciates not only the aesthetics of the floor pattern created by New Again Rubber Pavers & Tiles but also its slip-resistance and sound absorbing properties. Installation: Specially designed for easy handling and installation, New Again Rubber Pavers, each manufactured in in the form of a 7-3/4" long dog bone, interlock with adjacent pavers, when installed with or without adhesives on site. New Again Rubber Wall Tiles are molded in 1 meter x 1/2 meter shapes scored in the middle to give the appearance of two separate square tiles. Both New Again Rubber Pavers and Tiles require only periodic cleaning with a water hose and sufficient water pressure to wash away dirt caught in seams and scoring. A sound sub-base is critical for job completion. Excavate approximately 12 inches (300 mm) of soil below the required finished level of New Again Rubber Pavers. Use either string lines or chalk markings to ensure straight lines in the necessary directions. For a permeable system, replace the soil with approximately 9 inches (230 mm) of compacted, crushed rock, one inch (25 mm) maximum of damp leveling sand, then lay the New Again Rubber Pavers or tiles. This will allow moisture to penetrate between surface joints and to evaporate in the base. Some bases will require a plastic perforated drain to remove possible moisture build-up. The impermeable system consists of a hard base (concrete or asphalt). This type base is for load-bearing areas or situations with standing heavy traffic or moving vehicles. If New Again Rubber Pavers or Tiles are to be placed over a hard base, under cover, consideration must be given to the slope or fall for moisture movement. Normally a 1.5% fall to a drainage pit has been formed in the base. New Again Rubber Pavers and Tiles require a curbing or finished edge to hold the entire system together. Two types of edging are available: (1) New Again Rubber Safety Curbing and (2) New Again Rubber Anti-Stumble Edge. These products are made from the same material as New Again Rubber Pavers and Tiles. New Again Rubber Pavers and Tiles can be cut with a heavy duty band saw or a break-off blade utility knife depending on the size of the project. Click HERE for Installation Details. The Split Paver in Gray is no longer offered. Prices are exclusive of Shipping & Handling. Appropriate Sales Tax will be added for deliveries to NY, CT or NJ.